Scenario: called to A&E to assess a 40 year old woman who hurt her ankle after stepping off a curb. No other injuries. prior injury to joint causing antecedent laxity and non-acute radiologic abnormality. 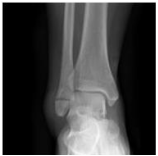 Ankle fractures and sprains present with similar symptoms – thorough exam is warranted to prevent unnecessary imaging. Gross deformity, bony tenderness, ecchymosis, discolouration, and inability to weight bear - suspect fracture. REDUCE any gorss deformity by providing analgesia and providing in-line traction on the limb. Evidence of vascular compromise requires urgent vascular input. 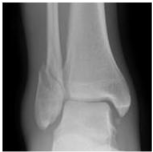 Ankle x-ray series required only if bony tenderness in distal 6cm of tibia or fibula, or inability to bear weight both immediately and in the emergency department. Not applicable to patients under 18. Some use absolute threshold of 6 years old and apply rules. Clinical judgement to prevail in patients that are intoxicated, have other distracting injuries, neurovascular compromise, or gross swelling preventing adequate palpation. Assess for asymmetrical space around mortise and talar shift. lateral malleolus fracture is evident and vice versa. Type A - transverse fibular avulsion fracture, often associated with oblique medial malleolus. Usually stable. Type B - oblique fracture of lateral malleolus with or without tibio-fibular syndesmosis rupture and medial injury. May be unstable. Type C - high fibular fracture and tibiofibular ligament rupture with medial malleolus transverse avulsion fracture. Usually unstable and require fixation. Macroscopic tear – ankle strapped in dorsiflexion 4-6 weeks. Review in fracture clinic 1 week, likely requires physiotherapy. Complete tear – below knee walking cast 4-6 weeks. Review in fracture clinic 1 week and physiotherapy. If non-displaced fracture – backslab and non-weight-bearing. Fracture clinic <1 week. If displaced fracture or dislocation - urgent senior review. Investigate further with CT scan. 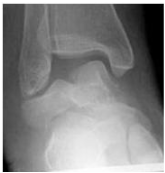 Often open, or convert to open due to blisters, edema, necrosis – treat as open fracture above. Look for associated injuries – spinal compression, calcis, tib. plateau, pelvis. - Pain over soft tissue versus bone/physis. Growth arrest is concern for physeal injuries and patients will need regular follow up. If open fracture – need immediate orthopaedics consultation. Manage as above. Generally, undisplaced fractures can be managed non-operatively in below knee backslab and non-weightbearing. These patients require review in fracture clinic in <1 week. Any displacement requires further investigation (usually with CT scan) and often require reduction +/- fixation. This should be discussed with a senior.